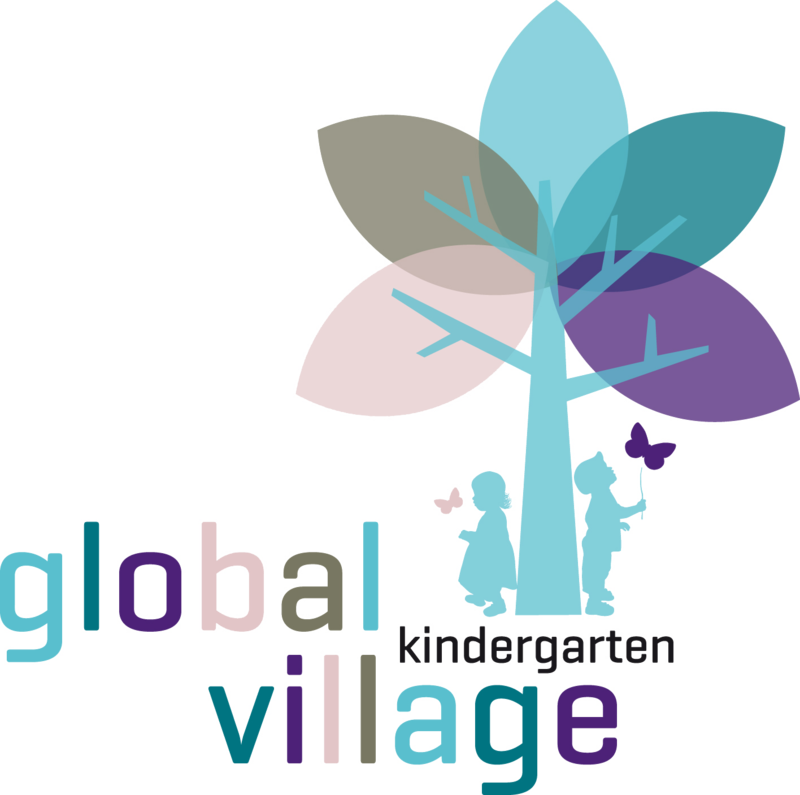 In October 2013 we opened our Global Village, the first bilingual Kindergarten in Berlin-Tempelhof. 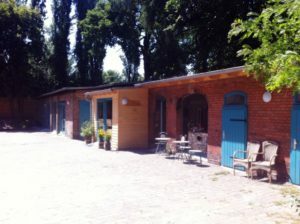 On beautiful grounds with 3000 square meters area in the western part of Mariendorf, up to 110 children between the age of 1 and 6 are taken care of. 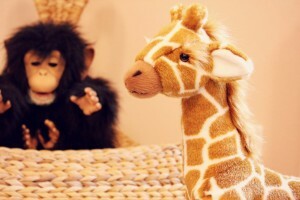 They are divided into 6 continent groups and one baby group. Speech promotion, intercultural work, cognitive development, creative learning, individual support and project orientated work are the main emphasis for our educational institution. Our Global Village is not simply named as such, it represents the process of different cultures intertwining. At Global Village the children embark on a tour around the world through the various continents. They wander with their teachers year by year from one continent to the next. Our premises are specifically furnished to accommodate each particular continent. The intensification of global relations on a familiar level between individuals, represented by an additional foreign language, awakens the curiosity of the children and offers them the opportunity to network and playfully learn about other cultures. Exemplary cultural expression forms such as images, sounds, imaginations, symbols, and rituals are strongly represented in our project orientated work. We offer high quality all day child care, and support the children individually with relation to their age with the acquisition of elementary competences. We regard every child as a unique individual, for that reason every child in our institution stands in the center of attention receiving a vast array of opportunities to learn and grow. It is our emphasis that the teachers and parents work closely together to individually support every child, being aware of his or her needs and skills, so that these can be optimally developed to encourage a healthy self-image and confidence. The English language promotion is implemented in the method of immersion and is integrated into the daily routine. Extra developmental activities through external providers is to be found in the subjects of movement, science, art and music. 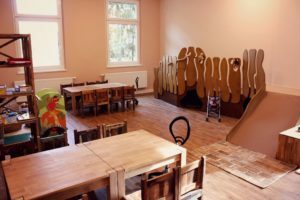 In the year before school entry the children are provided with a special preparatory preschool program, which allows the children to successfully and smoothly make the relevant transition to primary school. With the establishment of a realistic operating Kita like Global Village, we strive to ensure compatibility with work and family. We wish therefore to support working parents with our long opening hours. With our quality management system, we clarify the implementation of our concept and profile of our institution. All included rules secure recurrent work procedures, establishing trust, the organization of information channels for internal and external interfaces as well as examination to secure the quality of our work activities. The Ringstraße is located in the western part of the hamlet Mariendorf in the district Tempelhof-Schöneberg. Public transport accessibilities are more than adequate and there are plenty of parking spaces located nearby. The natural beautiful property with its old tree population allows us the opportunity to grow our own fruit and vegetables. In total we have to our disposal an area of around 3000 square meters with a large outdoor playing area, which is fitted with suitable playground equipment. The special concept of Global Village is to be found here also, through uniquely designed ‘continent corners’ such as the Asia garden with its sense and feeling features, or the cowboy and Indian playground. The amphitheater is used for our many festivities and performances and offers enough space for everyone taking part. Our petting zoo houses our sheep, who are cared and looked after by the teachers and the children together. Furthermore we have the renovated stables to our disposal, which are used within the framework of a specialized conception. Here one can find amongst other features the parent café, the children bakery and the sport/event hall. 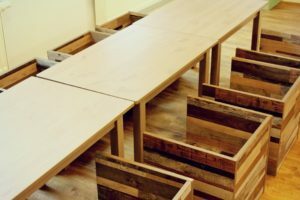 Within our red bricked house is located the group rooms with their quarters, the kitchen, office and staff room, as well as themed and multi purposed rooms customized to the various educational subjects. 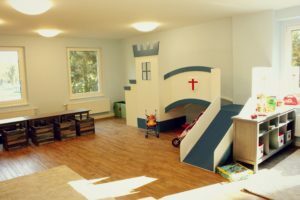 The rooms are designed and facilitated with the most sanitary and harmless building and layout features especially suited to the age and requirements of the children. The rooms are functionally furnished and suited to the continent concept, each with its own specialized design and layout. Global Village is a comfortable oasis for children and naturally also for their parents. The educational concept of Global Village is the basis of the working method in our Kindergarten and is definitive for all of the staff in our institution. The organization of the educational processes is orientated on the needs and interests of the children, the concept of the institution and the Berlin education program. Every child is sorted into a fixed group and is looked after by 2-3 members of staff, depending on their age. All the staff look after the child together so that they become dependable reference figures for our children, providing them with a feeling of security in the group. The children go through various groups during their time in the Kindergarten (depending on when they join), and are enriched with a preliminary knowledge of the various continents, ways of life and characteristics of the inhabitants of the different continents. The change takes place from year to year together with the group and led by the teacher, so that they don’t have to be separated from their reference figures. 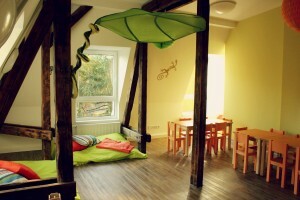 Spatial and conception changes have a positive effect on the development of the children. The size of the group is directed according to the age of the child. The activities of the children are orientated around the Berlin education program, mixed with the conceptual approaches of each group and based on the respective theme in relation to the particular continent, as well as other project themes. There are overarching project themes such as holidays/festivities, rituals, nature, music and language. Obviously most activities are tied in with the educational categories, for example in morning circle where the children cultivate social and cultural contact, either verbally or non-verbally. Music is made, there is movement and the children count. The day of the week, the date, and the weather as well as current project themes are all discussed. The familiarization phase of the child on entry is well protected and on an individual level in a group of the same age, the whole phase is discussed together with the parents. All parents are informed in advance about our familiarization concept. The English language support is part of the daily routine for every age group as a parallel language to German. In every group there is a German speaking and an English speaking member of staff, who from the beginning onwards, with much love and care, allow the children to get used to the English language. At Global Village there work people who speak English as their mother tongue or at least at the level of a native speaker. The staff employed as native speakers speak (as a rule) exclusively in the second language with the children. The children have through this a representative for each language. The learning of a language is achieved through imitation, observation, awareness and through love and a sense of security. It is also learnt through the daily routine. All senses are stimulated and the fine and gross motor skills are advanced. Kindergartens with English language support in other districts have confirmed that this concept has its many advantages and is therefore invaluable. Those institutions who choose to offer such an activity are greatly sought after and are gratefully appreciated by many families. Institutions with such a concept find exceptional regional acceptance and enjoy a high demand. In Tempelhof there was previously no institution that could offer English orientated language support. For this reason and because of the high demand for Kindergarten spaces, came the idea to bring Global Village to life. Global Village gUG is a member of the Großbeerenstraße e.V. network in Berlins second biggest industrial quarter. The network was initiated in November 2008 by the industry and commerce support to encompass shared interests and to develop synergies and projects. In order that Tempelhof develops itself as an attractive business and living district with a higher life quality, it is important that local businesses have no difficulty filling job vacancies with qualified young people and employees who have children. A cultural and family-friendly environment are decisive factors for a company and its employees. The base quality for this is a good functioning infrastructure. 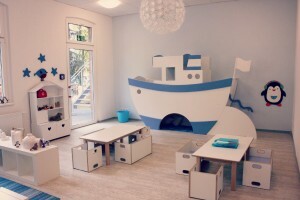 With the establishment of our Kindergarten we strive to achieve harmony between work and family. The concept of Global Village is especially suited to the interests of workers and their families due to our long opening hours. To guarantee for the long term the uniqueness of the concept and to enable all the children the chance of a good preschool education combined with exceptional care, Global Village gUG is reliant on important co-operation partners as well as donations from sponsors and supporters. We hope that we have stimulated your interest in our project and we look forward to a positive response!